If you have ever hired movers to pack up and relocate all your belongings to a new house, you know that it’s not quite as simple as welcoming them into your home on the day of the move and then heading out for a coffee while they take care of all of the heavy lifting. The movers will seriously lighten your load, but you will still have a list of tasks to accomplish before the day of the big move. Likewise, you should not expect to be totally “hands off” if you hire a mobile industrial packaging team to come to your site and prepare your product for shipment. You may be able to save time and money by having the industrial packager come to you, instead of pre-ordering custom crates or dropping your finished product off at the packager’s location. But only if you commit to handling these important jobs before Shipping Day. 1) Finish building the product. If the mobile packaging team arrives to find that your product is not ready to be crated, you are likely to incur a penalty fee. You also run the risk of further delays if the team is scheduled to be out at a different customer site on the date your product is finally ready to go. 2) Meet your deadline. Yes, it bears repeating. A surprising number of manufacturers of high-end equipment wind up spending extra to have the mobile packaging team return a second day because their product was not ready to ship on the originally-scheduled date. 3) Clear some space. The packaging team won’t want to waste valuable time cleaning and organizing your space before they can begin preparing your product for shipment. So make sure that there is ample room for people, supplies, and equipment to move around all sides of the item that is being packaged. 4) Measure twice. Double-check the sizes of all the doors and hallways that the crated product will need to pass through on its way to the truck. Then share those measurements with the packaging team, so they can adjust crate dimensions or alter the packing site within your facility, if necessary. 1) Do a site tour. Long before Shipping Day, the industrial packaging team should arrange to visit your facility so they can identify any obstacles to success. It’s much easier to devise creative, cost-effective solutions before the shipping deadline looms. 2) Be the experts. You know all about your industry and your product; the mobile packaging team, on the other hand, knows the packaging process inside and out. So it’s up to them to coordinate all the details related to preparing your product to move safely from your facility to your customer’s site. For example, you should be able to tell the packagers how much your product weighs. But it is the responsibility of the packager to choose which fork truck can handle that weight and how widely the skid runners need to be spaced in order to accommodate the blades of that particular truck. 3) Triple-check the measurements. The mobile team should estimate the expected size of the crated product and then verify that it will be able to successfully exit the building, as well as fit onto or inside of the chosen method of transportation. 4) Deliver all supplies. 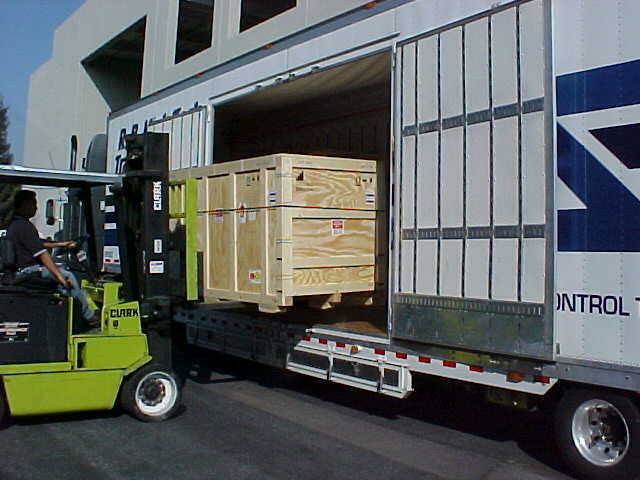 The mobile packaging team should bring the pre-constructed parts of the crates and skids, plus any lumber, plywood, fasteners, foam padding, donuts, brackets, strapping, and anything else needed to assemble the crates and interior protective elements. 5) Bring equipment. The packagers should bring all the hand and power tools needed to assemble the crates. They may also need to be bring (or arrange to rent) lifting and rigging equipment, if those machines are not available at your facility. CDC Packaging Can Lighten the Load! Hiring a mobile industrial packaging team to come to your facility can simplify the process of delivering your product to your customer. But to guarantee smooth sailing, you will need to tackle a few important tasks before the team arrives to begin packaging. Contact us today so we can help you sort out the details of your next shipment.